Description: The Red Clover's most defining characteristics are the purple-red flower and the v-shaped stripe of white across the green leaves. The flower has a rounded head. The flowers bloom generally from April through September, but I spotted flowers still in bloom at the end of October (2003). Leaves: In the Peterson's Guide for Edible Wild Plants, the distinct mark on the leaves is called a "pale chevron," or I call it a v-shaped white stripe. The compound leaves are from 15-40 cm (6-16 inches), and the leaves grow singly up the stalk of the flower. 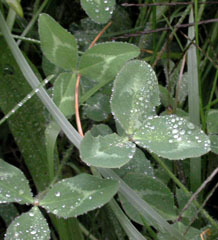 Habitat: Red Clovers are all over campus, in fields, in thickets, roadsides, and could grow in another random location. Location: There are clovers growing by the Commuter Rail just outside of the Practice Field, but there are also clovers growing on the outskirts of Chapel's Field and in other thickets around campus. Use: Clovers in general are healthy to eat in any way, basically: in salad, as a cooked green, ground to flour, or blended with another tea. Clover is high in protein! 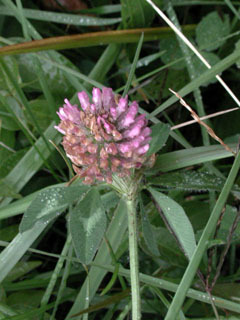 The most common things to eat on the Clover are the flowerheads and the leaves, but are easier to eat if soaked for about an hour or boiled.